• Click the "Login/Register" link located to the right in the upper navigation bar of the website. To properly process your order you must complete each field where a red asterisk mark is present. If you are a Milwaukee Tool employee or distributor, see below for login instructions. If I am a Milwaukee Tool employee or distributor, how do I login? • You must login to the store through Milwaukee Connect to gain access to special pricing and be able to pay with Co-Op funds. • We accept Visa, MasterCard, and American Express. If you are a Milwaukee Tool employee, you may also pay with Co-Op funds and will be required to enter additional billing information at the Payment Method step of checkout. If you are a Milwaukee Tool distributor, you may also pay with Co-Op funds. If I am a Milwaukee Tool distributor, can I use my co-op funds on the store? • Yes. However, you must login to the store through Milwaukee Connect in order to pay with Co-Ops funds. If I am in sales, can I use my distributor's co-op funds? • Yes. However, you must login to the store through Milwaukee Connect in order to pay with Co-Op funds. At the Payment Step of checkout, you will be prompted to provide a Distributor Name and AB # for billing purposes. Do you sell Empire and Stiletto branded merchandise? • Yes. To browse Empire and Stiletto merchandise, click the corresponding categories in the top menu bar to see the full product catalog for each brand. What if I need an item that is not offered in the company store? • As the industry leader in creative ideas, we offer thousands of the newest and most unique items from the industry's top suppliers. If you need assistance finding the right item to suit your needs, contact your Milwaukee Tool Account Team and let us do the work for you! • Your order will ship via FedEx Ground service, unless otherwise instructed. Increased rates will apply for expedited shipping. • Items that are stocked in inventory at our warehouse in the Atlanta, GA area will ship the next business day if your order is placed by 1 P.M. EST. Items that are made to order will ship after the production time stated on each product page. How can I know transit time for my orders? • Items held in inventory will ship from our warehouse in the Atlanta, GA area. 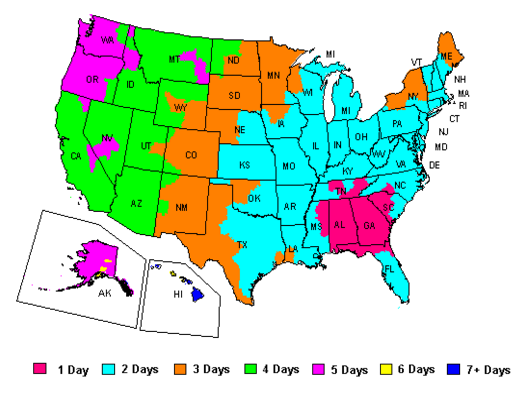 Please, see below for standard FedEx Ground transit times from this location after your order has left our facility. Items produced to order will ship directly from the factory. These locations are noted on each product page. • To check the status of your order you may navigate to the My Account page, or contact your Milwaukee Tool Account Team with your order number. • Once your order has shipped you will be emailed tracking information for your order. You may also navigate to the My Account page. If you need further assistance you may contact your Milwaukee Tool Account Team. What if I have Returns/Exchanges? • Inventory Order Returns - Merchandise ordered from existing inventory may be returned up to 30 days after date of purchase for a full refund. Goods must be unused and in original packaging. Any damaged, worn or obviously used merchandise is unavailable for return, except in the case of a product that has a manufacturing defect or print error. Upon completion & acknowledgment of a factory level quality control error, defective merchandise will be replaced at suppliers expense or given a full refund of original purchase price. • Custom Order (Bulk Buys) Returns - Merchandise ordered in bulk or with a custom design or imprint is not available for return, except in the case of a product that has a manufacturing defect or print error. Defective merchandise will be replaced at suppliers expense or given a full refund or credit of original purchase price. We strongly recommend that you review product samples before placing a custom order. Blank samples will be shipped to you free of charge! A virtual sample image of the product with your logo is available for your review prior to order. Pre-Production Samples with your logo on the product are also available with your logo for a fee. The fee is dependent upon product & decoration method, so please contact us for cost and lead time. • Back Orders - In the event that any or all item(s) ordered are out of stock you will be notified at the time of checkout. Back order items will ship as they become available. • International Shipments - Please contact your Milwaukee Tool Account Team for international shipping options. Standard international shipments require the consignee/customer to pay duties & taxes and brokerage fees mandated by the government for which the shipment is received. Please check with your local agency for details on estimated fees. Pinnacle Promotions, Inc. is not responsible for duties and taxes. The customer is responsible for these destination fees. If an international package is refused for any reason, we will not refund the customer for the merchandise nor shipping & handling charges. We do not pay for return shipping when the package is abandoned internationally. • A small number of products sold on this store contain substances that the state of California has determined may cause cancer, birth defects, or reproductive harm. According to a 2018 update to the Safe Drinking Water & Toxic Enforcement Act of 1986, commonly called Proposition 65, any products containing these substances that are sold in the state of California are required to have warnings describing their potential harm. • These products will have a warning label and description on the product page (see example below). We work with dozens of suppliers and always try our best to work most with suppliers actively devoted to compliance of all safety laws.